Here is a summary of classes that I typically teach. I have 8 years of face and body art instruction experience behind me. I've spoken at the biggest and best face and body art conventions on the planet; including, FABAIC, EFABE, The Midwest Haunter's convention, Bodessy, Kapital Kidvention, CHAC, as well as FABA-TV and countless individual workshops in 6 countries and counting. I have taught thousands of painters from all walks of life, all around the world. I have taught absolute beginners and experts, there's always something for everyone. Don't look at my work and say "there's no way I can paint that." Take my class and let me show you that you can paint better than me. I can custom tailor a class to your liking. We will cover this information when you book a workshop with me. I will do my best to assess your needs to make the most of our time together. I can teach just about anything. All classes can be presented as a short demo or a full day hands-on class. I am great in front of a large crowd. Demos and lectures are fun, the time flies by and many people can be info-tained. For a more intensive learning experience, a smaller-hands on class (up to 10 people usually) is the best way to get information passed along. We now offer private sessions 1-3 people at our private studio in Charlotte, VT. This is the absolute maximum training I can provide. And if you're out of state, now may be a good time for a pilgrimage to Vermont. It's truly beautiful. The Skull - The most important face you will learn - Join Sean Avram in an artful trek through the bone chilling art of the skull. Sean will demonstrate easy ways to create your own skull designs as he reveals tips and tricks that will make your skulls so much more detailed. 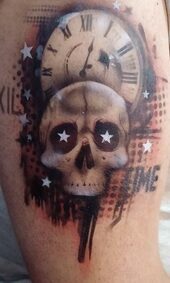 Sean will cover the basics such as layout, shading and highlighting, and some extra details that will add those finishing touches to your skull design. From cute and not so scary skulls to horrific pieces of work, Sean will show you how to become a master at painting skulls. and More!". This class is designed to teach you the fundamentals of monster making and give you hands on experience with the faces in the book. By the end of the course, participants will be able to recreate the monsters in Sean’s book “Ghouls, Gore and More!” from Ruby Red (original books were from Snazaroo) as well being more comfortable in creating your own monsters from scratch. NEW!! Learn to Tattoo like a Pro! : We are pleased to announce that Sean is an approved tattoo pro artist. 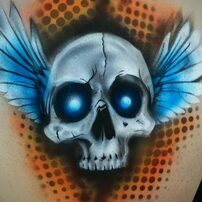 This means that he teaches Wiser Oner approved, Tattoo Pro Approved workshops on these hyper-realistic airbrushed tattoos. Add this service to your business and watch your business grow. These tattoos have great appeal to the teenagers and adults that don't want to get face painted. It's great for people who want to "test out a tattoo before they get it for real". This system is awesome. This class will more than pay for itself. Robots and Metal - It’s time to transform and roll out some exciting robotic designs! In this class, Sean Avram teaches his great strategies in designing robot faces. Get ready to craft incredible illusions in blending muscle and skin as metal in the easiest, fastest and most effective ways possible. Designs taught in this class will benefit festival painters, birthday party entertainers and anyone wanting to know what to paint on teen boys and fathers. You will use the techniques taught in this class every time you paint. Sean reveals design, concepts, and the easy, fundamental secret to painting skin to look like shiny metal. This technique will even work for your next princess crown painting! 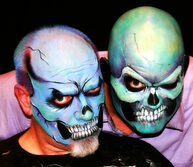 Airbrush Face Painting - Are you ready to double your earnings? Sean will show you how with hyperdrive! This system can double the amount of people you can paint in an hour without sacrificing quality. No skill required! If you can hold a can of hairspray and a playing card in the other, you can paint up to 30 people and hour. More people painted means more money. If that weren’t enough, think of these benefits: Having an airbrush setup means you can also provide temporary tattoos simultaneously, which expands your appeal to a much broader audience. You will always have something for the teenagers! Waterproof makeup that can last for days if desired, yet still cleans up easily with soap and water. You can use a separate air hose to inflate balloons. 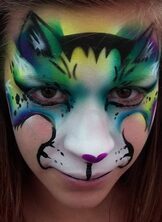 People like the smell….you will have to take the class to hear the rest of the amazing advantages to airbrush face painting. All supplies will be provided, but feel free to bring your own kit if you’d like. This is a hands on class that will include information on airbrush basics, products used, where to buy, how to price, set up, tear down, everything in the middle and how to paint awesome designs on people quicker than a hiccup. How to be an awesome body painter: Here is the beginning of your body paint legacy. This is quickly becoming one of Sean’s most popular classes. The class starts with everyone painting in a paint along, as Sean shares his story and the secrets of design. Everyone paints and ends the day with an awesome creation for their portfolio. Information in class will include essentials such as:, where to find models, what products to use, where to paint, how to break into the professional scene, getting your work published, copyright and legal issues, health and safety, caring for your model, tricks of the trade, design secrets and the list could go on all day. This class is great for anyone who loves body painting of any skill level. Airbrush Body Painting - Depth and Detail - This class is all about the thousands of little details you can add with airbrush techniques to give your designs that extra punch. 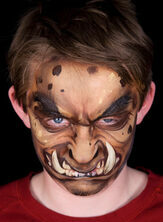 You will learn advanced special FX and airbrush tricks. Render clouds, horns, teeth, skulls, graveyards, dragons and perfect trees and forests, outer space, flames, metal and more. We will also go over advanced stencil technique, and crafting your own stencils. 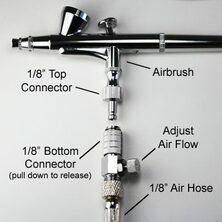 This class is a bit more advanced, and attendees will find it most useful if they have general knowledge of the airbrush. Body Painting - Depth and Detail - This class specializes on mastering jaw-dropping depth and rendering mind-blowing detail. You will learn hands on, techniques that will give your face and body art an extra dimension. This class will include both hand painting as well as airbrushing techniques. You will paint your model along with Sean as he takes you through some awesome designs step by step. By the end of class you will have an excellent piece for your portfolio. Body Painting - Clothing - This class is a great way to start body painting. Faux clothing is a very popular, effective and fun body paint design. In this class, we will cover everything from satin highlights to metal buttons. By the end of the class, you will be able to craft realistic folds, seams, lace, drop shadows, buttons, ribbon, and more. This class will use both sponge and brush as well as airbrush techniques. Body Painting - UV and invisible UV - Not afraid of the dark? Do you love that eerie, fun glow of ultra-violet light? This class is for you. UV light body painting creates fantastic images that cannot be duplicated in normal light. There is a system that also needs to be followed to achieve the best look in this style of painting. Sean will start with the basics and move on from there. We will create bold designs in 3D and will learn the magic of “Ghost” by ProAiir...this makeup is invisible in regular light but glows in UV! You will learn all you need to know to begin airbrushing, nothing, that’s something, there but not there. Illustrations in Face and Body Art - This class is great for beginners and advance painters alike. Have you hit your plateau? Have you perfected your butterfly face and are ready to really kick your game up a notch? Are you ready to enter body painting contests at a convention near you? Illustration can be just the thing you need. Learn to craft intricate designs with stunning depth and detail. A picture says a thousand words, time to leave your audience speechless. © HyperFocus Art - 2014 All Rights Reserved. All photographs or parts thereof on this website are copyrighted and cannot be copied, reproduced, or used in any matter whatsoever without the written consent of HyperFocus Art.